The Opening Night of the Clear Lake Chamber Music Festival, featuring Kenneth Nichols’ 80th Birthday Celebration and the world première of “Letters Home ” a song cycle for voices, piano and strings will be held at the Lorne Watson Recital Hall, Brandon University, on Thursday, July 21, 2016 at 7:30 PM. Manitoba composer and music professor Ken Nichols is in a playful, after dinner mood. His decades of service to Brandon University and to the wider community are soon to be honoured at the Clear Lake Chamber Music Festival with a performance of his song cycle “Letters Home,” so it is a great time to be reflecting on the meaning of home, on composing, on teaching, and on the environments and personalities that have shaped his compositions through the years. Ken Nichols grew up a child of the Canadian West. Born in Pincher Creek, Alberta of Scottish and English stock, his great-grandfather had been a canoe man for the Marquis of Lorne when the latter traveled across Canada in his progress as Governor General in 1881. Nichols was raised in a culture that recalled the earliest homesteaders, the fine British gentlemen who came to speculate on or hunt on the land, the Ukrainian pioneers, and the Aboriginal peoples who had preceded them all. The human personalities forged in this setting are unforgettable: the long-retired former RCMP officer Nichols knew in his youth, with a wide white beard, he says, “like Walt Whitman’s”; the solitary inhabitants of remote homesteads with their eccentric ways, and the descendants of the first European settlers of the region, among whom were the ancestors of Nichols’ late wife Marilyn. In 1962 he came to Brandon University, which has remained his professional home ever since, working in the university’s School of Music as it grew to become a nationally recognized institution under Dean Lorne Watson. are heard regularly in area churches and his piano works have been performed by students in music festivals and exams for many years. Nichols prefers “good, solid music,” he says, pausing to listen to the evening notes of a few summer songbirds, “And since I’m eighty I’m not ashamed to admit it.” Of particular interest to him is the human voice, for which he has often composed. His inspirations have been varied: he has drawn on the work of seventeenth-century English priest and poet George Herbert, on a translation by American Ezra Pound of an old Chinese verse, and on the poems of long ago Chinese courtesans. The sounds of Edwardian Brandon were the inspiration of “Brandon 1900,” a suite performed at last year’s Clear Lake Chamber Music Festival and which also featured as the soundtrack of a movie of the same name. Opera is another specialty: a boy soprano at the tender age of five, Nichols has composed an opera about Hilda Blake, the Victorian maid who was hanged in Brandon’s City Jail for the murder of her mistress, and a work, “Boy in a Cage” that confronts the harsh treatment of a special needs adolescent. “Letters Home” has a history of his own. It derives from an opera, “The Prairie Girl and the Chinaman,” conceived at the Music Theatre Ensemble Programme at the Banff Centre in the mid-1980s. The idea of the prairie as a vast inland “sea” from which a traveler might make “landfall” was an inspiration to both Nichols and writer Mark Morris. Together they produced songs that in their current form do not follow a strict plot line, but nonetheless capture some of the archetypal personalities and experiences of the far western plains of more than a century ago. Morris’s background is an intriguing complement to Nichols’s: the son of a famed travel writer and the product of an elite English education, Morris came to love the western plains as Nichols does, and together they created a tableau of the rugged life and the love for natural beauty experienced by the early European settlers of Alberta. There is an RCMP officer, with more than a bit of a stiff upper lip, a man who likes crisp military order and enjoys a day’s hunting. A rancher’s wife is enthusiastic and upbeat facing the challenges of a rigorous Western life. By contrast the homesteader’s wife is filled with dread at the some of the dangers that lie ahead, while holding to her beliefs that have kept her strong. Hints of an imperial conceit lurk in the background too: this was after all the era of Elgar’s “Pomp and Circumstance.” A duet at the end of the cycle summarizes the accomplishments of these hardy souls, taken in many cases from stories of Nichols’ own relatives, and conveys the strength and typical “Canadian mix” (as Nichols puts it) of their characters. Nichols is something of a hardy soul himself. Composing takes place each day: A self-confessed “morning person,” he puts in 3 to 4 four hours of work before noon, although he says that he used to do more. 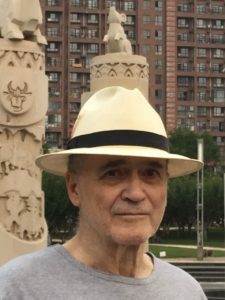 The themes of home and Western Canadian identity continue to serve as his artistic touchstones, as is Nichols’s recent experience of teaching and composing in China, where he “felt like somebody again” after having retired from Brandon University. It’s almost sunset now but the stories keep coming: of his studies with composer Dominic Argento, of his love of riding a horse and returning to the open spaces, and his plans for the future. So we can expect more music from Ken Nichols, whose work, with its love of nature, humor, and surprises, has brought us so many ways of understanding and hearing our prairie home. More details on the event are available at clearlakefestival.ca.